Lets go back to the start of the week. So, on Saturday last week we went to our local shopping center and he was such a good boy! 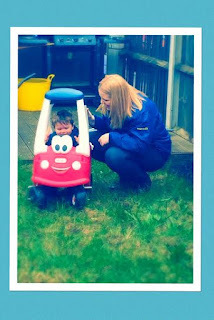 Didn't moan that he was bored or try to get out of the buggy or anything! I was actually a little surprised as we were there for quite a long time and I really expected him to get a little restless but I was wrong. Sunday, he started to feel under the weather and had a bit of a temperature. He was really cuddly and off of his food which was very unlike him. This continued into Monday so I took him to the doctors. He was given some antibiotics and I thought this would perk him up within a day or so. Oh how very wrong I was!!! 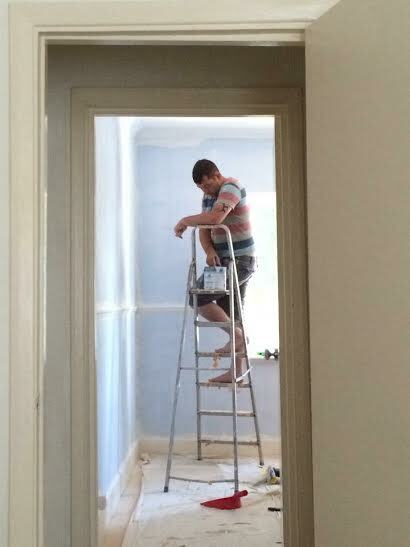 Things just seemed to get worse as the week went on. 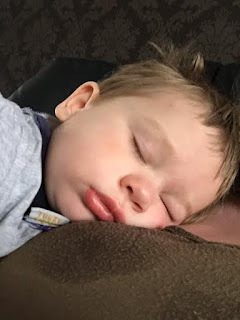 He was eating hardly anything, he wasn't sleeping well at all which meant that me and Hubby also weren't sleeping well, he was grumpy all the time and didn't want anyone else but me. It was draining. All bubba wanted to do was sit on my lap or lay on me all day. It was horrible seeing him like that as he is normally such a happy, cheeky little chappy so for him to sit and cuddle all day, I knew that he wasn't right. Come Thursday, his temperature had gone back to normal and he did seem a little better in himself. However, what wasn't normal, and what hasn't been normal ever since is his behavior!! Prior to last week Bubba was generally a good toddler. Yes he had his moments where he would have a tantrum but it was forgotten quickly and they were few and far between. I don't know what has happened but since he woke up on Friday morning, he has been like the devil child. Friday, he literally tantrummed all day! I'm not talking about little tantrums where he has a cry or moan and it's over within 10 minutes...Oh no! I am talking full blown screaming, hitting himself, banging his head against the floor, hitting us, crying, rolling around the floor, throwing stuff..THE WORKS! And what seems to make it even harder is that nothing that we used to do to calm him down seems to work anymore. If we ignore him he just does it even more. If we walk away he will follow. If we try to speak to him or calm him down he will hit us or scream even more. It is draining emotionally and physically and by the time it had got to Friday dinner time, I didn't think he could get much worse. I very quickly found out that he could get worse and things could get even harder! Bubba loves his food and we have never had any problem with him eating. Since Friday he has screamed at every single meal time and reached up to the snack cupboard refusing to eat anything but snacks. If we take the food away, he doesn't care. If we shove a spoonful in his mouth mid scream he will just spit it out everywhere! An hour into trying to give him some dinner on Friday I was in tears and Hubby was at the end of his tether. I didn't know what to do and I just felt stuck. I wanted and needed him to eat as otherwise he would have been hungry in the night time but I couldn't give in and give him snacks or biscuits as this whole vicious circle would never end!! This whole tantrumming and refusing to eat thing has got better gradually but I don't think we are out of the woods yet. Yesterday he only had 1 tantrum during the day and ate 2 out of his 3 meals with no fuss which is MAJOR progress from where we were. If I am being honest, I think this is happening as when he was poorly I just wanted him to eat and drink anything that he wanted as I just wanted to get anything into him. Now that he is better I think he expects this to continue and thinks that if he has one of these tantrums then we will give in and give him snacks and biscuits rather than him having to eat his dinner. It is so hard when he has this tantrums as I hate having to watch him hit himself in the head or scream so much that his little face turns bright read and tear stained but I know that we are doing this for the greater good. I don't for one second think that this is going to be the end of the tantrums as I sure once they have stopped for a while they will come back with a vengeance but for now we seem to be finding a way to manage them which means we get through the day with my sanity in tact! Around this time last year, I had just started to delve into the world of blogging. I wasn't brave enough to post anything at that point but I started to read blogs and follow bloggers on twitter to get a feel of the ''blogger life'' (if that is even a thing!). I started to see that bloggers had the opportunity to win awards and to be nominated in different categories. To be honest, it did seem like a little bit of a popularity contest to me but I remember a couple of weeks later when I launched my blog, that I really wanted to be nominated. 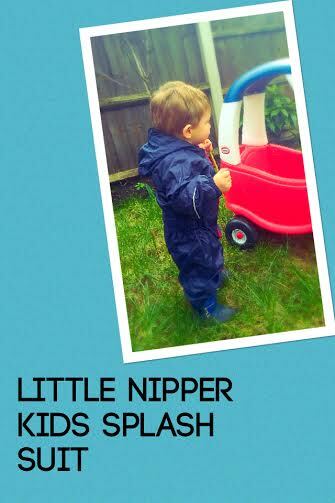 It was silly really as My Mummy Spam was in the super early stages of it life and had hardly no one reading it but I think I wanted to be nominated so badly to prove to myself that someone other than my Mum was reading my blog. Needless to say..I wasn't nominated! So...now for the cringy begging part. 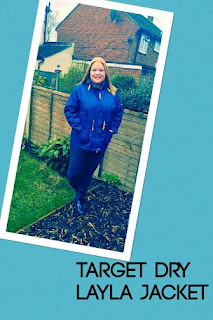 If you enjoy reading my blog then I would love to be nominated! At the moment there are 2 awards events open. One is the Mums and Dads awards by Tots100. You can visit their nomination form by clicking on the badge below. The other is the BiB awards (find this form by clicking here!). This is run by BritMums and I would love nothing more than to be nominated for their 'Fresh voice award'. This is for blogs that are less than 18 months old and My Mummy Spam is just that. 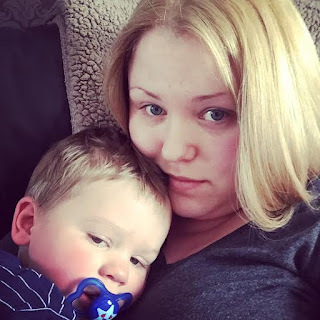 My URL (as I believe both ask for it) is: http://www.mymummyspam.co.uk and you can find all of my social media links at the side. To the Mum who's child woke up every hour last night for no reason..It's okay. It will get better and this phase will pass. As hard as it is just power on through and remember that it will not last forever. To the Mum who is fighting to get her screaming child into the buggy...It's okay. We have all been there and/or are there on an almost daily basis. Your doing everything right and just ignore all the judging eyes from the non parents around you. Us parents know how it is and we are all behind you! To the Mum who's child only wants to eat bread sticks and rice cakes...It's okay. Well, nutrition wise it's not okay for these little monster to live off just this but it's okay that this is happening. It's normal and I am sure that every parent has been their at least once in their lives (if they say they haven't then they are lying!!). Just stick to your guns when you deiced how to tackle it and keep remembering that it won't last forever and it is just a phase. 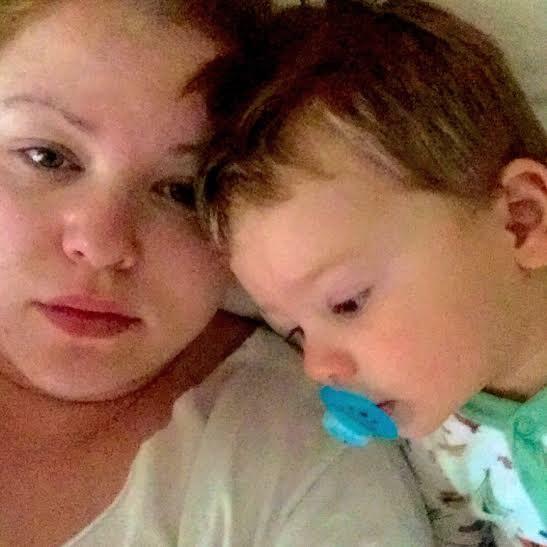 To the Mum who is questioning if they should take their little one to the doctors or not or will they just been seen as the ''overprotective new mum''...It's okay. Screw what others think! If you want to take your child to the doctors then take them. If you think you can manage what ever your little one has at home then you do that. You know your child better than anyone so just keep doing what your doing and remember.. It will pass! 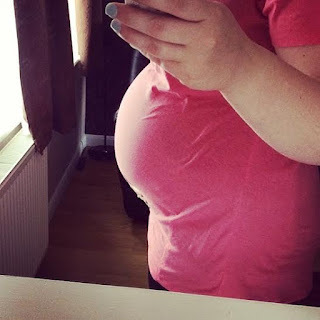 To the Mum who feels alien in her new Mummy body...It's okay. You grew and birthed another human being with your body! I don't think we give ourselves enough credit for this. Yes you may not be able to wear your bikini anymore or fit into your skinny jeans but who needs bikini's and skinny jeans when they are going to get covered in poop, sick, snot and god knows what else. Be proud of your stretch marks and Mummy pouch! To all the Mum's out there...HIGH FIVE! You are amazing. You are strong. You are a Mum! Things may be hard at times and we may constantly question if we are doing the right thing but just remember...everything is a phase and it will be okay. Even the good times are phases until we go back into a another crappy teething or fussy eating stage. Keep going and keep strong for one day these little terrors won't be asking for cuddles or throwing their food off their plate. they will be out in the big wide world, maybe even with terrors of their own that are now going through a phase and we will be wishing they could just squeeze back onto our laps for a snuggle. Chocolate bunny bum baking with Dr. Oetker. Easter conjures up many images for me. Easter eggs, Easter Sunday dinner with family, baby chicks, lambs, the Easter Bunny… The list could go on and on. 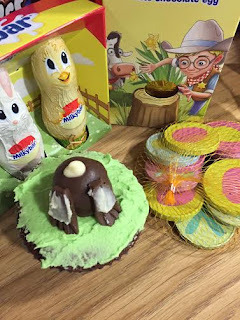 Dr. Oetker decided to combine a couple of my favourite things from Easter and create an amazing edible six foot tall Bunny Bum which was placed on display in London. This chocolate lovers dream was commissioned by Dr. Oetker and crafted by baking expert Juliet Sear. 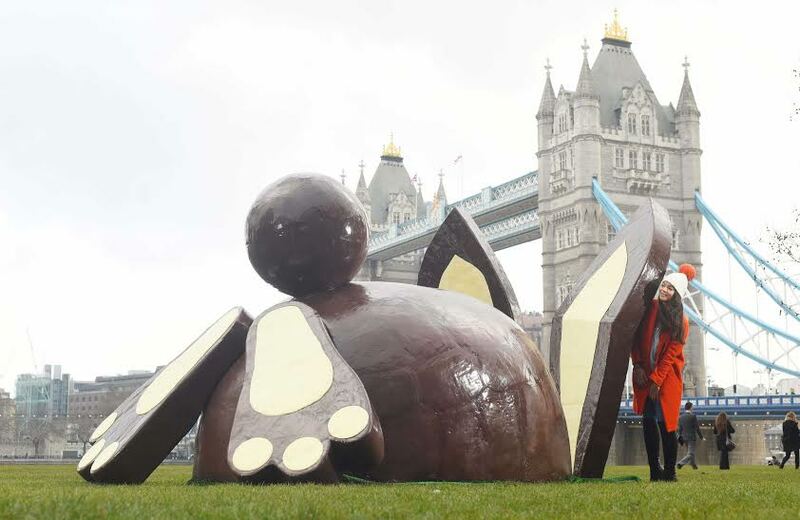 Taking over 110 hours to create and using more than 3000 bars of Dr. Oetker’s Fine Cooks’ chocolate, it brought a smile to commuters’ faces today in Potter’s Field Park. This giant creation that shows the Easter Bunny’s Bum burrowing into the grass was constructed during a 10 day period and includes over 450kg of chocolate. Juliet made the giant creation piece by piece, allowing the parts to harden and dry overnight. She then finished the Bunny by attaching its 8 foot ears and feet which were prepared with Dr Oetker’s Fine Cooks’ White chocolate. So why am I telling you about this? 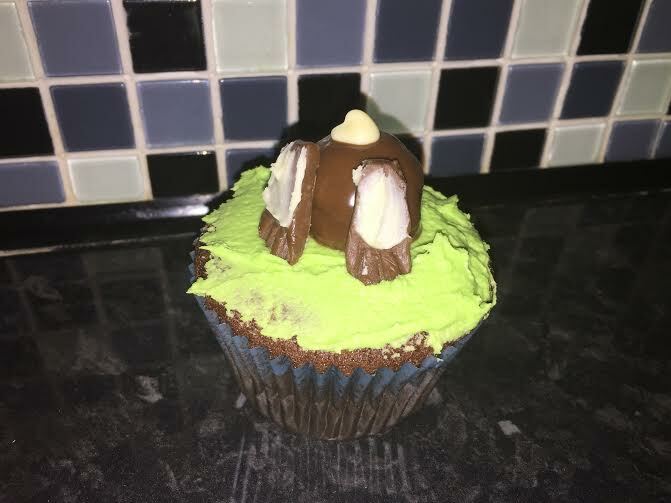 Well apart from the fact that a giant bunny bum being constructed in the middle of London is just awesome, we were sent a recipe to create some Bunny Bum cupcakes ourselves! 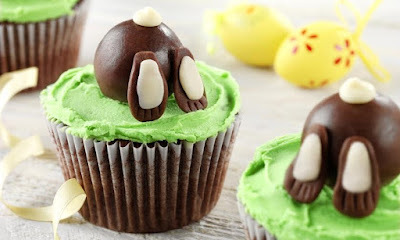 I’m not going to lie, this recipe wasn’t the easiest one in the world but it gave some fantastic results and we managed to make cupcakes that would make a wonderful Easter gift and a great alternative to the traditional Easter eggs. We included a little addition to our cupcakes to add more chocolate to it! We used the fabulous Dr. Oetker Surprise Inside Cupcake Centres in Rich Chocolate flavour. This meant that when these yummy little cupcakes are bitten into, there is a delicious, gooey surprise in the middle. So what do you think? Will you be making your own Bunny Bum cupcakes this Easter? For more delicious recipes like this one, pop over and follow@DrOetkerBakes on Twitter or go to www.oetker.co.uk. Updating your living room for spring. Spring is just around the corner and recently I have been thinking about how I can bring a little bit of this joyous season into our home. I love decorating to seasons and find that winter is nice and easy as I can accessorise with throw pillows, thick blankets and a shaggy rug. 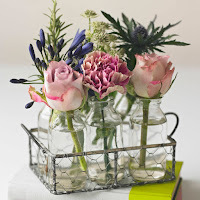 Summer is also a favourite of mine as, to me, nothing says summer more than quirky vases filled with fresh cut flowers and vintage tea light holders. Spring always feels like the season of tidiness and organisation so I thought I would put together a moodboard of what my perfect spring themed living room would include. The central focus of this room is the coffee table. 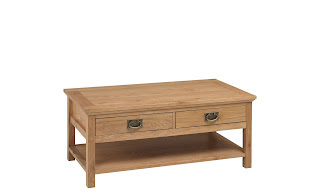 I have fallen in love with table featured above as the clean lines along with the slightly vintage look and integrated storage space just screams spring at me. I would then pair this with the vintage style glass bottle vase with some fresh daffodils to complete the center piece to the room. Green and yellow are colours that I associate most with spring and these throw pillows would suit the mood and style of the room perfectly. 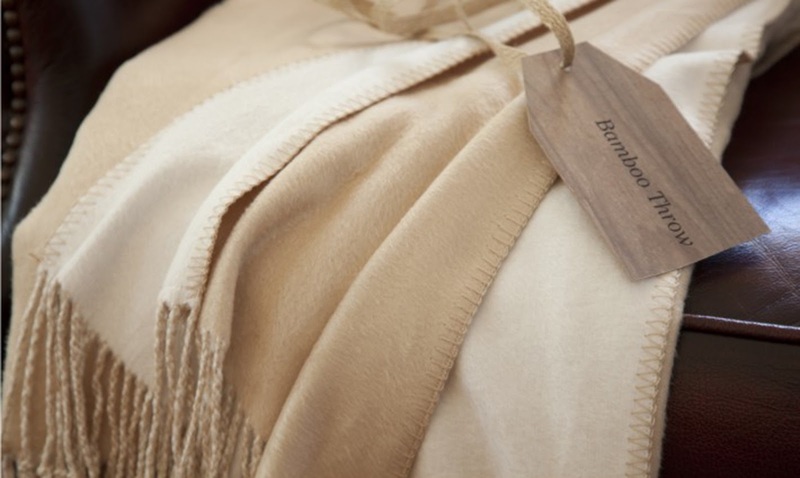 A light coloured throw like the one pictured would be fantastic for those slightly chilly spring nights and this one made from 75% natural bamboo has actually gone on to my birthday wish list as I love it that much! The neutral colour of this throw blends in with the room really well and wouldn't clash with the bright colours of the throw pillows. Lastly I have included this huge storage unit that would be the perfect way to store all of your living room essentials like DVDs and (in my case) children's toys after you have had that big spring clean. Have you got any tips for bringing a little of each season into your home? Let me know in the comments below! This post is has been written in collaboration with Fishpools. Today is Mother's day and I wanted to write to you to let you know a few things that I never really think about seeing when I see you day to day. I have always known that you were a great Mum. Even in those moments when we argued, screamed at cried at each other and I stropped at you for stopping me from doing things or going places..I know you were just being a good Mum. But, if I am being honest, I only realised how much of a good much you are when I became a Mum myself. Becoming a Mummy changed my life. It changed the way I think, my priorities, my views, my feelings to other people in my life...it literally changed everything. In the 18 months that Bubba has been part of our lives (27 months if you take into account when he was Tiny in my belly) I don't feel like I have ever thanked you for all the times you have been there. Thank you for being so supportive and excited when we told you that Tiny was going to be coming into our lives even though I know you didn't want to be a Granny before 50. Thank you for always being at the end of the phone during my pregnancy and not making me feel like a hypercondriac all the time! Thank you for coming to visit me all of those times in the hospital during the week in the lead up to Bubba's birth and for bring me a happy meal when I could face hospital food anymore. Thank you for being such a wonderful Nanny and loving that little boy from the moment you met him. So many people aren't fortunate enough to have their Mum's around and to be able to watch them become Nanny's and I am so grateful I have been able to see you become NanNan. Thank you for always thinking of Bubba. Like the time you and dad brought him a singing, instrument thing because he had been poorly or like the fact that you let some little person what the telly whilst he is eating his breakfast just because you know it makes him happy. Thank you for the times you have been on the end of the phone when I have called you almost in tears because I can't get my tiny newborn to stop crying and thank you for giving me advice and helping. Thank you for giving my son a safe, happy and educational environment to be in whilst I am at work. I don't know what we would do without you helping us whilst I am at work and it's all thanks to you that I can go to work and not worry about Bubba being unhappy or sad. He happily waves me off and I know thats because he is happy with his Nanny. Thank you for making me feel like a good Mum. I feel like I am doing a good job with Bubba when I hear what a good boy he has been, how well he has eaten his dinner and how easily he has gone to bed for you. Thank you for everything you have ever done for me and for everything you do for my little family. We love you so so much and I am so lucky to have a Mum as beautiful, generous, caring, selfless and sometimes a little crazy as you. I know that at times you feel under appreciated and like no one cares but please do know that I care more than you will ever know and I appreciate you so much. I love you more than you will ever know and I am grateful to you in a way that I will never be able to explain. Changing Room of the Year 2016! Mothercare has claimed first place in the Best Retailer category for Changing Room of the Year! Yes that is a real thing and no I hadn't heard of it before either! 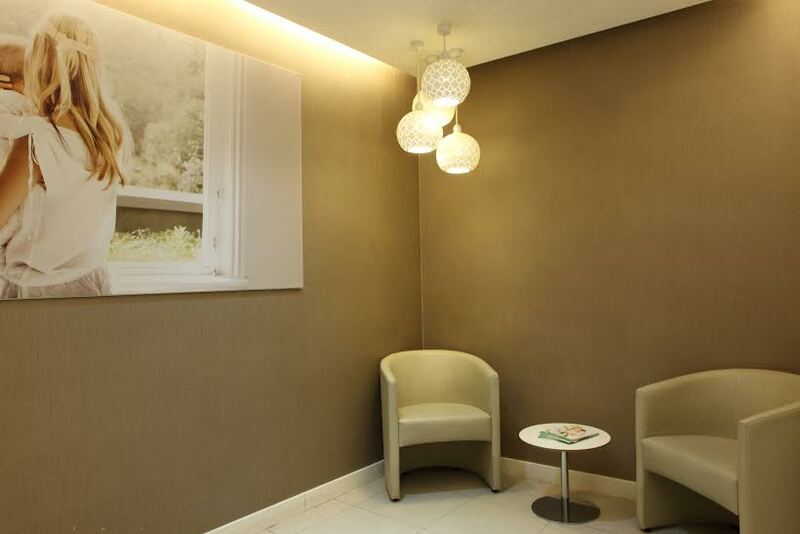 Now in it's third year, the Sudocream Care & Protect launched the Changing Room Awards in 2014 to recognise the very best in changing room facilities across the UK. The first campaign promoted over 1000 parents to vote for their favorites and this year it was the Edmonton Mothercare branch that was awarded baby Changing Room of the year. 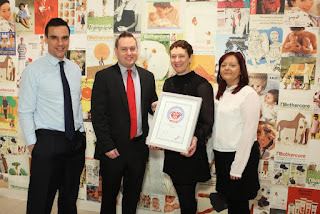 Mothercare won the award because of their calming rooms, with comfy changing mats, disposable towels with ample space to stow your pushchair or pram. I have used the a couple of Mothercare's changing rooms before and I have been very impressed. One that I used came with an additional feeding room with comfy chairs for parents and even a tea and coffee machine!! I was super impressed! Sudocream Care & Protect is a nappy changing essential so it makes sense for them to be judging this award. The cream provides triple protection against nappy rash at every change and comes with a flip top lid which is perfect for when you are trying to change a wiggly baby. Its hypoallergenic, demagogically tested and free from artificial colours or preservatives. You should be able to find Sudocream Care & Protect in your local supermarket..to see stockist please visit their website here. So...Congratulations to Mothercare for making a room that is comfortable and practical for Mummy's and Daddy's all over the UK! 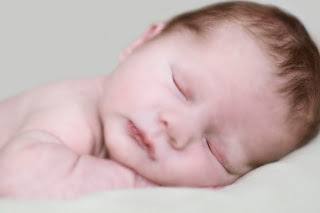 According to research under taken by Infacol, Britains Number One Infant Colic Remedy, the happiest hours in the day for women with babies is either first thing in the morning when their babies wake up or when they snuggle down for bed. In fact, Mum's couldn't deiced if they liked morning or evenings best with 27% voting for each and 1 in 5 Mum's saying they liked early or late afternoon. Only 6 % said they were happiest at lunch time! This got me thinking about why Mum's like this time of the day the most. For me, I would totally agree with them. I love the mornings! Going into Bubbas room in the morning is one of my favourite moments as I get to see his sleepy little eyes peeping over the cots bars at me. I then carry him into our room and we have toasty snuggles whilst watching cartoons. It is so special and I honestly cherish those moments as I know that he won't stay little forever. I also agree that I love bed time too. I don't mean my bed time (although I do love my sleep!) but when it is Bubbas bed time. I love the little routine we have got into. He has his bath, then we have a snuggle on the sofa watching Curious George or something along those lines, then he gets his PJ's on and we head upstairs for bottle and story time. We sit in his bed room reading a story and having a cuddle then off he goes to bed. This little routine works so well for us and I really enjoy our story time. If I had to pick between the 2, I don't know which one I would go for! The truth is..all of the moments I spend with Bubba are the happiest..even when bubba is tamtruming and even when I think back to those colicky baby days (side note - Thank you infacol for being a god send!!). Visit www.infacol.co.uk for more information. Today, Bubba and I had a go at baking the 'Crafty Little Biscuits'. As we haven't done much baking together before so I thought this would be a good one to start at and I was right :) I started off measuring all of the ingredients out and getting all of our Dr Oetker essentials ready. Once I had followed the super simple instructions, the biscuits were ready to go in the oven in no time at all. Then came the fun part...decorating!! To decorate our crafty little biscuits we used the Dr Oetker Designer Icing and writing icing as well as some Dr Oetker hundreds and thousands, mini wafer flowers and chocolate hearts. I was particularly impressed with the designer icing as there was so much in the pouch and it came with 4 different nozzles to create different patterns. I'm hoping that you can see which ones were my attempt and which ones were Bubbas :) I thought we could decorate these scrummy little biscuits as a gift for Bubba's Nanny's and I think they will be very pleased. I did sneak a taste of one of these biccys and the lemon touch to them is so refreshing and moreish! So, if you fancy getting your bake on this Mother's day then you can download you copy of Bake Mum's Day here and find all you will need on Dr Oetker website here. Note - The products to make these were sent to us for the purpose of this post but all views expressed are honest and 100% my own. 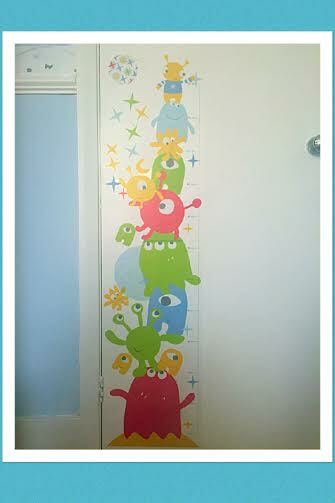 We were sent the Alfred and the Aliens height chart sticker which is described on their website as ''a vibrant, bright, out of this world design with aliens, stars and planets''. I totally under estimated just how many aliens, starts and planets there would be! There were so many stickers that we only ended up using half of them as we didn't have enough space on his door to stick them all on. 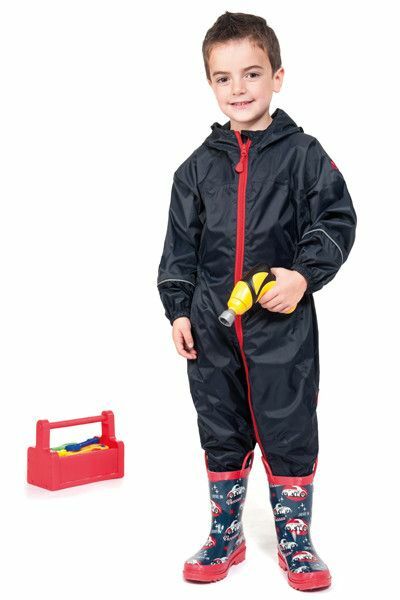 I saved them as thought I could replace them if any fell off but the design and quality of this item is so good that I highly doubt any of these will be falling off any time soon (unless little hands get on it and pull them down!!). 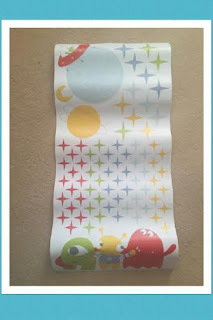 The pack comes with 2 main stickers that are the height chart itself and then lot's and lot's of additional stickers for you to decorate around it. The stickers are really thick and durable! None ripped as me and Bubs pulled them off and they all stuck really nicely to the wall. When I was looking at what we had left once we had stuck what we wanted up I saw that we had quite a few little stars. I thought I could keep these and write on them each time I measured Bubs and stick it on to make it look a little neater. I am not sure if this was the Gro Company's plan with these little stars but either way, it worked really well. You can grab yourself your own height chart and see the whole range by clicking here to visit the Gro company's website. Note - this item was sent to us for review purposes but all views and opinions in this post are 100% honest and my own.